^ George W. Hart (1999). “Zonohedrification”. The Mathematica Journal vol. 7 (no. 3). 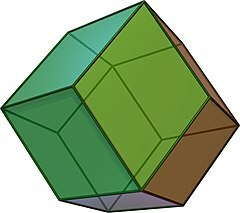 http://www.georgehart.com/zonohedra/zonohedrification.html. ^ Weisstein, E.W. (2002). CRC Concise Encyclopedia of Mathematics, Second Edition. CRC Press. ISBN 9781420035223. https://books.google.com.tw/books?id=D\_XKBQAAQBAJ. Weisstein, Eric W. "Rhombic Dodecahedron". MathWorld（英語）.